robnunnphoto.com - Posts / Home - Photo Recipe - Abandoned Buildings, Priddys Hard. 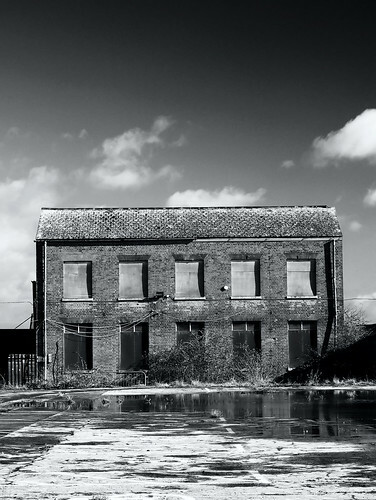 Photo Recipe - Abandoned Buildings, Priddys Hard. Sunny day with deep blue sky. Polarizer on lens adjusted to darken that blue sky. Shooting position chosen to try to keep things symetrical. Red / Yellow filter simulation used in post processing to further darken the sky in the black and white conversion. I know it sounds like a contradiction, but lovely sunny days, with deep blue skies are often my favourite times to take photographs to convert into black and white. I guess it's because here in England often the light is overcast and grey. There simply isn't much contrast around - so photos look washed out and bland. Sometimes I'll turn to HDR if there's some interesting details on show, or just to boost that missing contrast between the dark shadows and bright highlights. On nice Sunny days though, I don't need to too. The key to getting dark skies is to shoot on a day when there's plenty of colour in the sky. If you then put a Polarizer on your lens you can turn it to make that colour even darker - giving the start of the effect you can see in the photo above. Because we've added more saturation to the image, when we convert it to black and white in Photoshop / Silver Efex Pro / Elements / Lightroom, etc, we can use the colour filter simulators to make the image even more dramatic. I find that a red or yellow filter give the strongest results, and that green can be a nice compromise. The other thing I like to do when shooting old buildings (or any architecture) is to make a decision about whether the photo is going to be symetrical, flat and / or perspective distorted. What I mean is that if I think that a symmetrical treatment might work, I'll shift my camera position (me!) around until I'm pretty sure I'm in the middle. I'll also try and make sure my camera lens is parallel with the front of the building. If I want the walls to be reasonable straight I'll back off a bit and use some zoom. If I want the building to look taller and more dramatic, I'll get closer, use a wider angle, and get closer to the ground. For that type of shot I'll probably also try and get an angle where I'm looking at the building towards a corner rather than straight on. So there we are. Next time you're out with your camera on a sunny day with a deep blue sky, play around with your polariser and think black and white! ps Polarizers must be bought to match the filter thread size on the front of your camera. They increase saturation and reduce glare, but do cut out some of the light, so using one will slow your shutter speed down, so watch that the shutter speed doesn't drop so far that it maight induce camera (you) or subject (what you're shooting) shake and blur. Always go for a circular polariser where possible, the older non-circular ones can effect your cameras auto-exposure. Hey. That is a great picture. A one that doesn't leave the viewer cold. That picture raised one question. It seems to be 0,6 degrees rotated ccw. Is it intentional effect or was that something you missed or what? And BTW these photo recipes are great. I would really love to see more of these. Glad you like the recipes - I'll try to add one a week, time allowing. The skew is my wonky eyes, I can't always get the photos straight, even in Photoshop!